Just in case you wonder why I keep calling Obama a fascist (btw, see also here and here and here and here for other examples of Obama fascism just in the last damn WEEK). Barack Obama is a FASCIST. Period. Unless you want to get technical and label him a Marxist-fascist hybrid (both being forms of socialism and as ultimately similar to one another as Coke is to Pepsi). President Barack Obama has an ambitious plan for Washington bureaucrats to take command of the oceans—and with it control over much of the nation’s energy, fisheries, even recreation in a move described by lawmakers as the ultimate power grab to zone the seas. The massive undertaking also includes control over key inland waterways and rivers that reach hundreds of miles upstream, and began with little fanfare when Obama signed an executive order in 2010 to protect the aquatic environment. “This one to me could be the sleeping power grab that Americans will wake up to one day and wonder what the heck hit them,” said Rep. Bill Flores (R –Texas). But in his zeal to curb sea sprawl, lawmakers say the president’s executive order also gives Washington officialdom unprecedented reach to control land use as well. The effects of Obama’s far-reaching policy would be felt by numerous industries including wind farms and other renewable energy undertakings, ports, shipping vessels, and other marine commerce, and upstream it would also affect mining, timber, even farming. It will impact consumers directly through rules addressing recreational uses such as fishing and boating, and restricting the multiple use development of the ocean’s resources would also increase the cost of fuel and food, lawmakers say. The idea to create a policy to oversee multiple uses of the ocean originated during the Bush administration, but after push back from within the ranks, including Vitter, the idea was dropped. Critics of this revised plan say it is more narrowly focused, and that the Obama administration is taking their marching orders from environmental groups who want to move away from a multiple-use ocean policy to a no-use policy. “If you look at the catalyst for the entire initiative, it comes from the playbook of environmental groups that think the ocean ought to be controlled by the federal government,” Flores said. The ocean policy has already impacted oil and gas development in the Mid and South Atlantic, where more environmental analysis is now required to determine whether new studies must also be conducted to determine its safety, according to Interior Department Secretary Ken Salazar. Still in its draft form, the plan released in January contains vague goals that call for more than 150 milestones to be accomplished by next year that will determine how the ecosystem is managed. Belcher said his members are not opposed to having a process in place to manage all of the industries that depend on the ocean, but that they are already operating under numerous and sometimes onerous regulations that guide energy development, the shipping of goods, wind farm construction, and commercial fishing. The regulatory uncertainty created by the draft plan for industries and its employees that depend on the ocean has prompted numerous Republican senators to ask for congressional oversight hearings. “In these tough economic times, it would be unfortunate if Congress chose to ignore responsibility for limiting bureaucratic hurdles to prosperity,” the lawmakers said in a March 20 letter. The letter was signed by Sens. Vitter, Marco Rubio of Florida, Mike Lee of Utah, John Barrasso of Wyoming, Jim DeMint of South Carolina, Jeff Sessions of Alabama, Roger Wicker of Mississippi, Mike Crapo of Idaho and John Cornyn of Texas. The ocean policy has been a sleeper issue with very little media coverage, but now that it is starting to affect industries such as gas and oil production, lawmakers say congressional hearings are needed to take a broader look at its impact and consider public input from all of the stakeholders, not just environmentalists. House Republicans are fighting back by tightening the purse strings they control and hope that by cutting off funding to implement the policy, and putting a stop to officials they believe are siphoning money away from other programs, they can block it from going forward. Rep. Hal Rogers (R -Ky.), who heads the powerful House Appropriations Committee, has been asked to put a stop to the administration’s “cloaked funding” by Rep. Doc Hastings (R–Wash. ), chairman of the House Resources Committee. “The Obama administration continues to move forward with zoning the oceans through implementation of the president’s National Ocean Policy without requesting funding specifically for this broad initiative and without answering basic questions about how funds are currently being diverted from other missions to fund this initiative,” Hastings said in an April 2 letter to Rogers. Although critics of the plan say it will create an unprecedented aquatic zoning commission, the administration has repeatedly denied it. Calls to CEQ, which oversees the policy, were not returned. “Are you confused yet?” Young asked the crowd. Environmental groups that support the president’s efforts include the Pew Charitable Trusts, which says that the fragile health of the oceans is being threatened by the increasing industrialization of the seas. “If poorly planned or managed, drilling for oil and natural gas in federal waters, developing aquaculture and building wind, wave and tidal energy facilities all have the potential to damage America’s marine environment,” Pew said in a statement supporting the president’s policy. But some believe bureaucratic interference on such a large scale is the real threat. “The last thing we need is the federal government running the damn ocean and a bunch of bureaucrats running around trying to determine whether you can fish in one spot or another,” said Dan Kish, senior vice president for policy at the Institute for Energy Research. The idea occurred to Bush, only Bush didn’t think he was a god and so he listened to the American people. Obama lives in an impenetrable delusion. So you need to understand that this isn’t obstructionist Republicans thwarting Obama out of partisan ideology; this is a Republican Party that is being consistent in clearly saying that this kind of takeover is wrong, wrong WRONG. 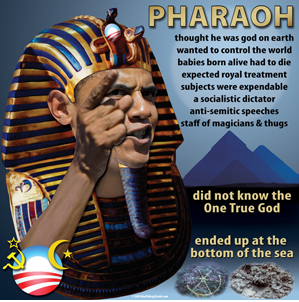 And America doesn’t need a damn pseudo-Pharaoh-Messiah. We need to decide what kind of country we want and whether we want to be beholden for everything from a master. That’s the bottom line. And there isn’t much time left for the American people if they want to be free from tyranny. Update, May 21, 2012: Obama is at it again. The Marxist-in-Chief is now undermining U.S. sovereignty by seeking to redistribute oil drilling revenues.